Automated Teller Machine or ATM fraud is on the rise according to some reports and there are discussions around which ATMs are most vulnerable, how cash machine fraud happens, why, and how we can prevent and detect ATM frauds. There are a few types of ATMs from which people can withdraw money from their checking, savings, and investment accounts. These cash machines can be bank owned, independent, or point of sale devices at a retail store. It is reported that bank owned ATMs account for about 80% of all ATM frauds and that the combination of stolen debit cards and related Personal Identification Number or PIN are often responsible to empty bank accounts quickly over the weekend when the banks are closed. We have mentioned before that the economy, organized crime, cash liquidity and weak security aspects of the ATMs are the major contributors to the rise in ATM fraud. Before we discuss these fraud elements, consider the fact that skimming devices which are used to steal card information are much more sophisticated now and seem to always be one step ahead as we continue to react to ATM risks while considering the costs. Now let’s discuss the above mentioned fraud elements and what we can do to collectively fight ATM fraud. First of all, although we hear that bank owned ATMs account for 80% or more of all ATM fraud cases, it is important to note that bank ATMs are also used in 80% of all ATM transactions. Therefore, it is important to note that we are still better off using bank ATMs as they are safer than other types of ATMs such as the ones placed in liquor stores. There are many things that individuals as well as ATM owners can do to reduce the ATM risks such as better monitoring of the ATMs for unauthorized installation of skimming devices. It is reported that most skimming devices are placed on ATMs during the early hours of the weekend when banks close for at least one day. A continuous monitoring of the cash machines can greatly reduce the risk of unauthorized device installation as it can not only deter criminals away from such ATMs but they can also help with investigations after suspicious activities are detected. 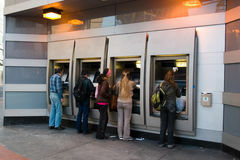 After the thieves install fraud devices and steal thousands of debit card information, they empty the bank accounts in smaller increments to bypass banks’ detection systems while they complete the organized scheme through agents all over the world using many different bank systems sometimes stealing hundreds of thousands of dollars in just one day and before the banks open to notice the fraudulent transactions. Therefore, banks must realize the evolving aspect of this risk and consider improved controls to protect themselves and their customers. Although the US banks resisted for many years to implement an additional layer of chip security on the bank cards due to cost considerations, the Europeans have been ahead in this area for many years. • When asked at the store whether you want to use your debit card as debit or credit, always choose credit unless you want to withdraw cash at that point of sale which will require your PIN. This will reduce the unnecessary risk of revealing your card code. • Check your bank account transactions to detect unauthorized transactions and report the suspicious activities promptly to the bank fraud unit. It is very important to keep the bank's contact information handy in order to save time when cards are lost. • Sign up for bank’s account change alerts. These alerts are available on most banks’ online services and they will alert you based on your preferred criteria. For example, you can be alerted with emails when a debit or credit transaction of certain amount hits your account. Visit Identity Management Institute for employee training and certification.